Kyle Drabek has a lot of firepower within his 6'1" frame. The son of former Cy Young Award winner Doug Drabek, Kyle has an arsenal in his right arm can make even the most skeptical scouts impressed. Drabek features three above average fastballs: a 4-seamer capable of touching 97 mph, a low 90's 2-seamer with plus movement, and a low 90's cutter he uses to bust lefties inside. His best pitch, however, is his plus-plus spike curveball. Thrown in the low to mid 80's, Drabek's curveball falls off by 10-12 inches as it approaches home plate. That type of vertical break combined with the velocity of the pitch makes it one of the better breaking pitches around. His 5th pitch is a below average changeup that has the potential to be average but will never be a go-to pitch. Drabek's command is inconsistent at best, varying from average to below average. He profiles as a 75 walk, 150 strikeout pitcher down the road. Drabek is fiery pitcher on the mound, likely the result of constantly being challenged to live up to his father's lofty expectations. He is prone to outbursts, but is much improved in that regard since going through the humbling experience of Tommy John surgery. For his first season in the Blue Jays organization, Drabek was assigned to Double-A New Hampshire. In his second year after returning from Tommy John surgery, he was consistent from month to month, and was named as the Eastern League's Pitcher of the Year in 2010. Drabek's season was highlighted by a summer no-hitter. With that being said, his strikeout rate of 7.33 is below what is typically expected of a potential top of the rotation starter. After the Fisher Cats were eliminated from the Eastern League playoffs, Drabek was called up to Toronto in September during which he made 3 solid, albeit unspectacular starts. His strikeout rate was once again low, but he has the repetoire to improve upon that with improved command. 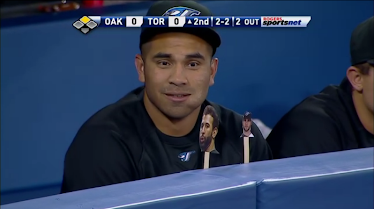 Drabek was named to Toronto's rotation in the spring, and due to a Brandon Morrow injury he was the #2 starter in April. He started the season strong, with a dominating 7 inning, 1 hit performance on the 2nd game of the season. After that start, however, he really began to struggle with his command, and his season went south. His struggles culminated in a demotion to Triple-A following a start against Boston in which he was knocked around for 8 runs across 4 innings. Since his demotion, Drabek has shown some promise but has seen many of the same issues from Toronto carry over. His strikeouts are still lower than one would hope, and his command has come and gone. In 4 of his 8 starts he allowed 3 walks or less in 6 innings, however in the remaining 4 he combined to walk 16 batters in 13.2 innings. He has given up a lot of hits and home runs, but that can atleast be partially attributed to the Vegas effect (.362 BABIP). 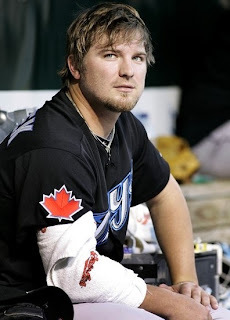 Drabek would definitely like a do-over for the 2011 season, as it's hardly gone to plan. Given the impossibility of that proposition, it can only be hoped that Drabek will try to find some positives in his 2011 season to keep his confidence up, then work in the offseason and spring on fixing the issues that gave him so many problems -- metaphorically finding his command, and literally finding his curveball. The only two starters who have a rotation spot locked up for 2012 are Romero and Morrow, so Drabek should have every opportunity to grab hold of one of the final 3 spots. As the center piece of the Roy Halladay trade, he will be given ample time to prove himself. Perfect world projection: Front of the rotation starter on a good team with regular Cy Young votes in his prime years, if his command returns and his changeup improves. Worst case scenario: Back of the rotation starter with flashes of brilliance but crippling inconsistency. Most likely outcome: #3 MLB starter on a good team if his command returns.